My Mother’s hands… elegant, knurled, smooth, cracked, rough, moist, strong, limp, soothing, creative, at rest… my Mother’s hands… hands full of love! from bruised and scratched up knees? †as if she was their own son or their own grown up daughter? and with community love now fully renewed? like new mottled skin of a life feeling fulfilled and bold! that now wipes up those gurgles of joy that drip from the laughing face of her full bellied boy! no more skinned kneesÖno more pitiful woe! with her dreams and her hopes wrapped in a bright kanga rainbow! Mama C, your poems are amazing, Thank you! YOU ARE INSPIRING!! LOVE HOW YOU WEAVE YOUR WORDS. LOVE FROM RWANDA! Mama C was greatly influenced in her early years by the jazz, blues and gospel that Kansas City is famous for and integrates elements of that experience in both her music and the rhythm of her poetry along with the African beats and hip hop vibe of her spirit. She explores the reality of her life as a Diaspora born African who has lived most of her years in Tanzania in many of her poems, one of the most famous being I Almost Lost Myself. Her song writing and performing talents have been showcased on stage, television and radio in many cities in Africa and in America during the annual UAACC Heal the Community Tour. She launched her book of poetry, Warrior Woman of Peace in 2008 and plans to launch her second book of poetry titled Life Slices – a Taste of My Heaven, in 2013. Mama C debuted several of her newest poems during the Poetry Africa Tour 2010 to Cape Town – South Africa, Harare – Zimbabwe and Blantyre – Malawi and the 14th Annual Poetry Africa Festival in Durban, all sponsored by the Creative Arts Center at University of KwaZulu Natal. Mama C is co-director along with George Kyomushula, of the newly established Arusha Poetry Club in Arusha, Tanzania which serves as a platform for East African poets and artists around the planet. 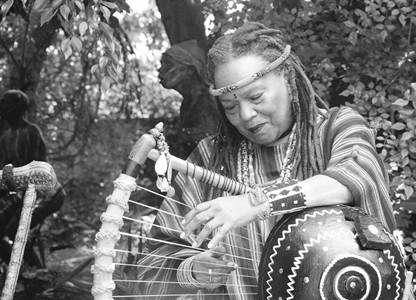 Mama C: Urban Warrior in the African Bush is a new documentary about Mama C’s life as an artist activist by film maker, Dr. Joanne Hershfield who is a professor of Womens Studies and Department Head, at North Carolina State University Chapel Hill.